Collecting sea glass has been a passion of mine since I can remember. Walking the Cape Cod shores looking for that coveted blue piece was exciting and rewarding as a child. It still is. 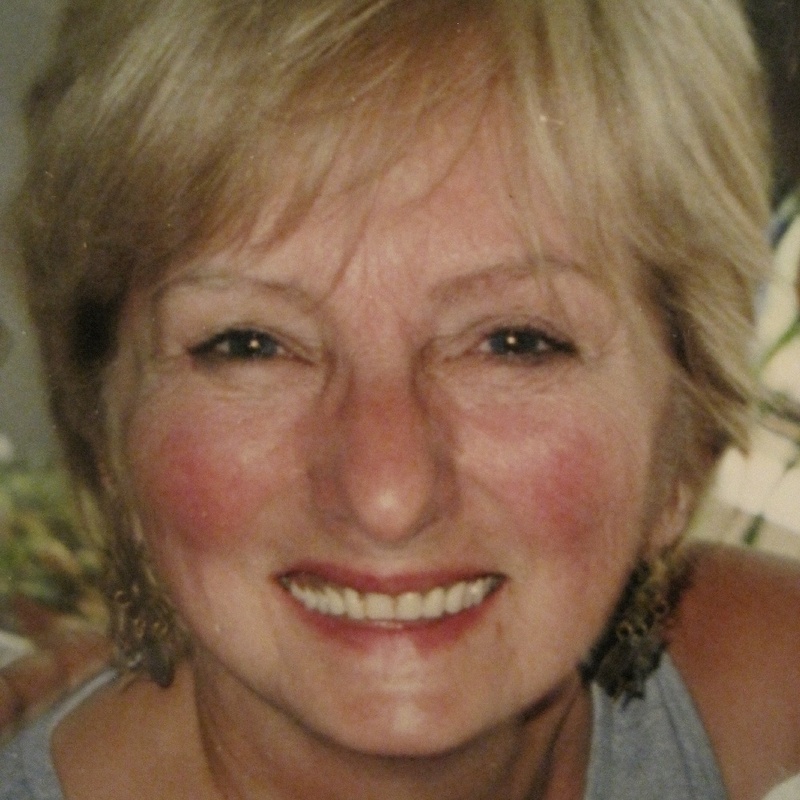 I now take these treasures and create both classic and contemporary jewelry designs with sea glass and sterling silver. Sea glass jewelry has become very popular. After being asked to make jewelry for friends and family I decided to make it a full time thing. 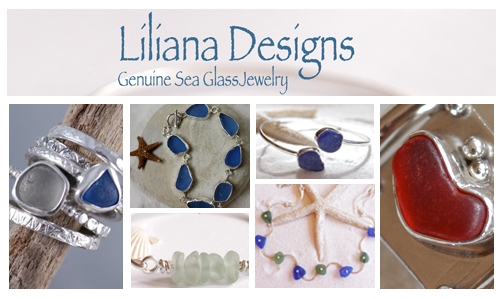 Liliana Designs was born out of a love for creating sea glass jewelry. It’s my way of sharing an appreciation of nature’s magical ability to take something discarded and turning it into a thing of beauty! My sea glass collection is quite extensive. All of the sea glass I use in my jewelry is authentic. My custom designs are created by supporting the customers vision of the perfect jewelry object using their own special sea glass or choosing pieces from my colorful collection. I live in the vibrant coastal town of Scituate Massachusetts that has interesting maritime and cultural history. The people in this community are friendly and engaging. I work out of my home studio which is right outside Scituate Harbor a little south of Boston and near Cape Cod. On days when the weather cooperates you’ll find me out kayaking along these and nearby shores of New England collecting sea glass and enjoying being out on the ocean. Why did you start an Etsy shop? I have been making jewelry for many years and was planning to set up a shopping cart on my website. I remembered an old colleague telling me about ETSY and how she loved buying handmade jewelry there, so I thought I should check it out. I was just beginning to do custom orders and figured I should explore the possibilities on ETSY. I set up my shop as soon as I visited ETSY in 2009. Everything was in place except the products. I didn’t start listing anything for several months. I guess I wasn’t convinced it was worth the effort. I did some research and discovered it was definitely cost effective to have an ETSY shop rather than a shopping cart due to the small numbers of pieces I expected to list. So I got started late in 2009. It has been a wonderful experience! I now post custom orders listed on ETSY for people who are willing to use PayPal and have a few made to order items listed along with one of a kind pieces. It’s been an ongoing journey learning the process of keeping the artist alive while working on improving sales. ETSY seems to have a star role at the moment in maintaining that balance for me. I roll out of bed at 6:30 and put the water on for coffee – a critical first step in getting my day started. I make lunches and breakfast and drive the kids to school – My husband works out of a sweet outbuilding he built in the back yard so we usually get to have a tea break later in the day. I check my email and respond to any queries from the evening before and then I check out my Facebook page. I try to post something once a week, but know it would be most effective if I posted once or more a day. If I am not careful I spend a most of the morning on the computer checking out Twitter and looking for different ways to promote my shop. I try to upload photos with lots of key words in the file as a way to get Google search results to find my website, business listings and ETSY shop. I get at least one click a day from me 🙂 I then mail any orders that have been completed and get back to my home studio to work on any pending orders. On days where my plate needs to be filled a little, I experiment with new design ideas. It’s in these moments that I am most inspired. I find myself wanting to always challenge myself and create something new so much of what I do is one-of-a-kind. Even the made to order pieces end up being one of a kind because of the shape, size and color of the sea glass I work with. I try to photograph my work and get it up onto my ETSY shop but truth be told… – that is my biggest challenge. I believe that is where this group comes in for me. I am looking for ways to engage and be engaged in the process of selling on ETSY and to help promote my fellow sea going designers! What is your favorite item in your shop? I am delighted at how popular my sea glass stacking rings and the matching sterling silver textured rings have become since I introduced them last year. They are my absolute favorites and number one seller. I have so much fun creating them. The process of making these rings is what excites me. I get to use my torch and my hammer in one sitting! I create the sterling silver bands and spend time hammering and texturing each one. 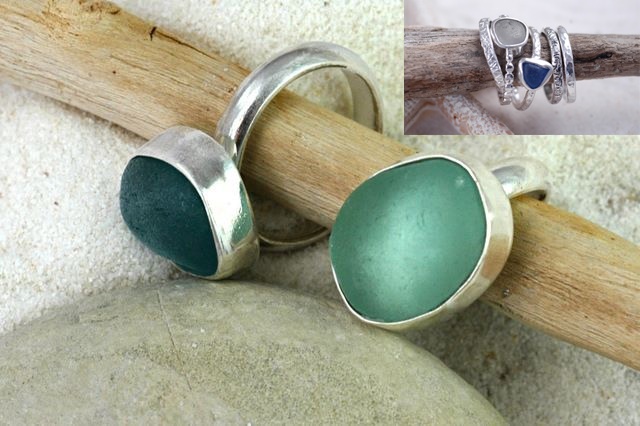 I then choose a select piece of sea glass for the made to order sea glass stacking ring and wrap fine silver bezel wire around the piece. I solder the bezel and sterling silver back plate to cradle the sea glass. I then solder the setting to the ring and do the finish filing, sanding and polishing. I love to see the ring come to life with the glint of shiny polished silver against the rough, pitted, sea tumbled and textured sea glass! What a gorgeous combination. What would you like the other team members to know about you? I am a web designer and have a photography background. I do both things professionally but am trying to spend more time on my jewelry. I am motivated but for some reason I haven’t been incredibly efficient on my ETSY shop as I’ve mentioned. I am really excited about the prospects of working with this ETSY team and hope I can contribute to and learn from all of you! I’m really delighted to be welcomed in! I look forward to reading other people’s interviews to get a small glimpse into the lives of my artsy maritime friends! If you’d like to see more of Liliana Designs, please visit her website, etsy shop, facebook page, blog, and twitter page. Tiffany and I jumped right in and started our company Girl Extraordinaire; a fashion company that concentrates on tees, tanks and accessories for all of life’s celebrations. We wholesale them to retailers and stores nationwide. Our website can be viewed at www.shopgirleo.com. In the midst of Girl Extraordinaire about 6-7 years ago, I began writing names in the sand beach and www.naturesnotebook.com was born. I consider myself to be the trendsetter in writing in the sand and merchandising this concept in a way people could buy these unique works of art. Paired with my professional photography, artistic eye and spiritual connection to the ocean and its beaches, Nature’s Notebook was born. I am drawn to the soft sandy edges of the sea, and have always felt inclined to write words or names, thoughts or dreams into the ever-changing landscape of the beach. Something about its tumultuous fate, an uncertainty that parallels our own lives, makes sea sand the perfect tablet for expression. And what better way to capture that expression, the memory and the magic of the beach forever, than in a photograph. I began sharing these captured moments with friends and loved ones 7 years ago through gifts and cards. Soon people were talking about these special snapshots, encouraging me to make these gifts available to anyone. 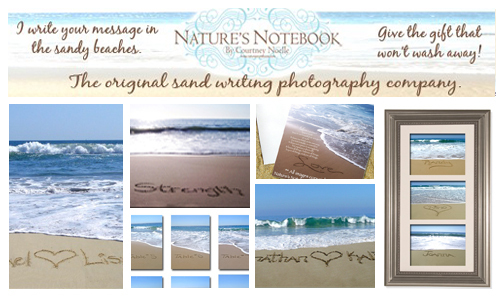 Touched and eager to share this passion with the world, I began Nature’s Notebook, an online collection of photographs and cards using the seas’ tranquility to express love and emotion! I am very passionate about what I do and love this art form and am blessed to share it with everyone. It seemed I needed to take the etsy plunge in addition to my website to get more exposure and expand the business. Plus, I loved how easy the Esty platform was to just get started. You didn’t have to buy a website, hosting fees, and the list goes on and on. So it just seemed a natural addition to my business. I have really enjoyed the artist community and getting to know other crafty creative people like all of you! My typical day isn’t the same day and it is always changing. I am an early riser, so always up and checking emails, following up and then I drive into Los Angeles to head up the Sales Department of my company Girl Extraordinarie. This is my main job and Tiffany, my best friend and I have been growing this business for over the past 9 years. I call clients, and figure out how to expand business and where our journey will lead us next. Right now we are launching sweetpeathebumblebee.com, a book series. I don’t think Tiffany and I ever really stop coming up with ideas……or working. So my day is spent with GirlEO, and my evenings are spent on Nature’s Notebook (aka writinginthesand). So days can get very full and really hectic, but with the help of my wonderful husband he keeps customers informed, and emails answered and helps me ship my items! God Bless Him! He is very loving and supporting, which helps a lot. 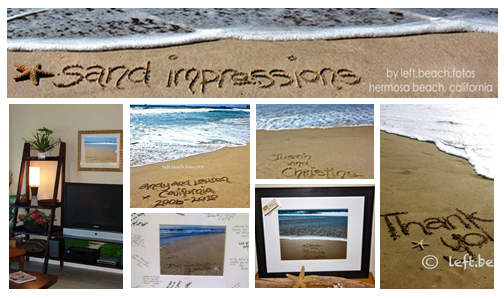 I enjoy the canvas “Names In Sand”, personalized beach photograph. The colors of the beach always seem to come to life and it reminds me what a true one of a kind work of art each one is. Each one comes signed, dated with certificate of authenticity. I live in Huntington Beach, and if anyone is close would love to connect and work on business ventures or potential ideas. Oh and I love my husband very much and just feel blessed to be able to share these with all of you! If you’d like to see more of Nature’s Notebook (aka writinginthesand), please visit her website, etsy shop, facebook page, and twitter page. 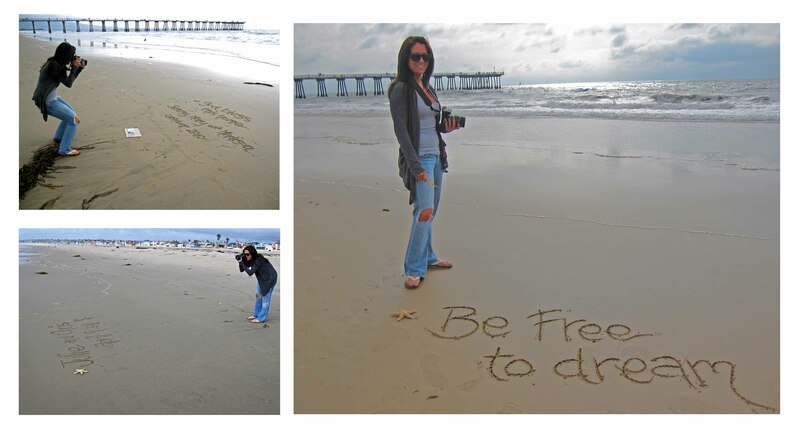 Courtney was also kind enough to volunteer and giveaway a couple of sand writing pics to our team. She is also extending that invitation out to our readers and followers of our blog as well. She will giveaway one JPG print emailed directly to you with any message you want written in the sand 🙂 Please feel free to contact her about the giveaway. I have forever been drawn to the beach…the constantly changing energy of the ocean, the texture of the sand, the smell of salt in the air and the natural beauty where land and sea come together. I have lived near the beaches in Southern California for all of my thirty years. I am lucky to live a block from the beach, in our comfy little home with my boyfriend and our doggie, in a small beach town just outside of Los Angeles. I started my Etsy shop a year ago, November 2009. One of my best friends had moved away from the beach and was getting married. I wanted to give her something creative and meaningful as a wedding present. I had planned to just take a photograph of the beach where we spent most of our youth and have it enlarged and framed. While I was out there, I got the idea to write in the sand her and her husband’s name and wedding date. She loved it so much, that she displayed it her wedding. A few people approached me at the wedding and asked if I would make them one. At the time, I was absolutely obsessed with shopping on Etsy and figured it couldn’t hurt to list a few photographs. After a few months, I received some nice feedback so I decided to concentrate on building my shop and focus on this as a business. My typical day starts off with a walk down to the beach with my boyfriend and our dog, Jax. We walk onto the Pier so I can check the surf and sand conditions and take a few minutes to clear my head. A few days a week, I meet with a group of girls and our trainer for a beach workout. When I get home, I head to my office/guest bedroom to read and respond to emails and convos, take down any orders I may have and spend a little time on Facebook, twitter and other’s blogs. If I have photos to take, I build the rest of my day around low tide, which can consist of editing photos, sending photos to print, packaging and shipping orders and getting inventory ready for different craft shows AND all of my everyday house chores. My favorite item in my shop is probably the beach themed wedding table numbers and place card favors. They have been such a huge hit since I’ve listed them early this year. I’ve received photos from customers who have used them at their weddings and showers and it’s just so neat to see how they decorate the tables with them. I would like the other team members to know that I am so excited to be a part of this group. Everyone is so talented and they’re such an inspiration to me. 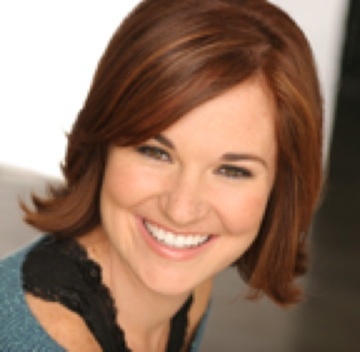 I love meeting new people and sharing ideas, so I’m totally open to communicating with anyone to help one another out. Everything I have done so far in my life has led me to this new profession as a seashell artist. I grew up in Newport Beach, California and moved to Santa Monica in my twenties, so the ocean has always been a big part of my life. I even spent an idyllic year in Hawaii after college…sold my VW and lazed on the beach soaking up the sun and surf. 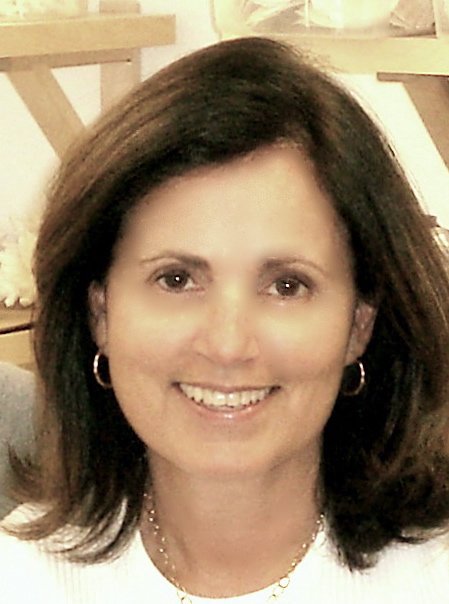 I started my career as an administrator in the film business, and along the way I dabbled in different crafty pursuits…there was my jewelry making chapter, my interior design chapter and my full-time, raising children chapter (costume making, model building, legos…and on and on). Much later, one of my sisters told me about a seashell mirror she had made and my first thought was of the mass-produced, tacky, seashell products. When I saw her mirror, I literally gasped! It was so beautiful. I took it to my friend who owns a very posh home decor boutique in Santa Monica (an Oprah favorite) and she had the exact same reaction. She wasn’t sure how they would sell, but the next morning, she called me excitedly to say she had sold it to Maria Shriver. So, that was the start of my involvement in working with shells and sea life. On a personal note, I have been married for 29 years and have two amazing sons, ages 21 and 24. They are the very best part of my life. I’m also an avid tennis player and a chocoholic. I’ve had my own website since 2004, but when the economy went south in 2008, I decided I needed another venue. I opened my shop on Etsy in July of last year. Coffee, newspaper, spend too much time on the computer, then head for my little studio which is about five minutes from my house. I just love it there. It is near a multitude of coffee houses, yogurt shops and restaurants. So when I feel the need, I can walk out the door and pretty much get anything I want. Some days I’ll meet girlfriends for lunch which is always a nice diversion. I oftentimes work while listening to books on ITunes. I’m currently “reading” the third installment of the Stieg Larsson Millennium trilogy. I’m also a big fan of David Sedaris, Julia Sweeney and Scott Turow. My current favorites are my new Christmas ornaments. Working mostly alone, I love the camaraderie of the Etsy community. I’m open to conversation, and welcome any suggestions for my shop. I’m more than willing to share techniques and business tips. I’m very grateful to Kate for starting our Coastal Club. If anyone is ever in Los Angeles, please let me know, would love to meet you! 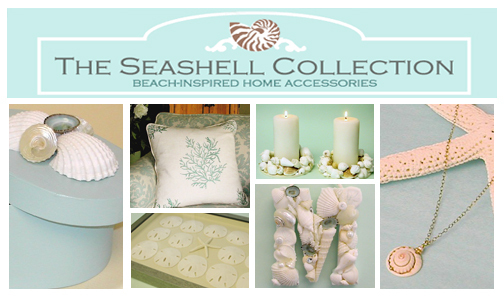 If you’d like to see more of Seashell Collection, please visit her website and etsy shop. Born in the Cornwall, UK with a very rugged coast. I was surrounded by the sea and boats. I am a sailor, I met a Canadian in England and now live in the wild woods of Muskoka, Ontario, Canada. I haven’t left the water behind, my partner, Mark is a wooden boat builder for the local lakes and we still sail locally. I haven’t forgotten my roots and have brought them with me in my ropework, which is self taught.The Ashley Book of Knots is my bible. 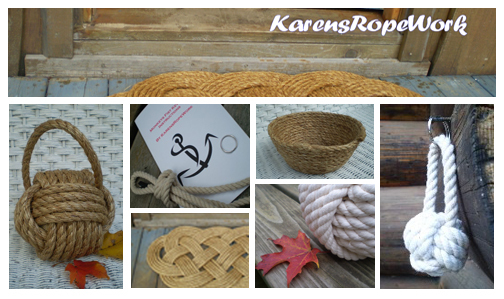 I love working with the rope and each piece is different. 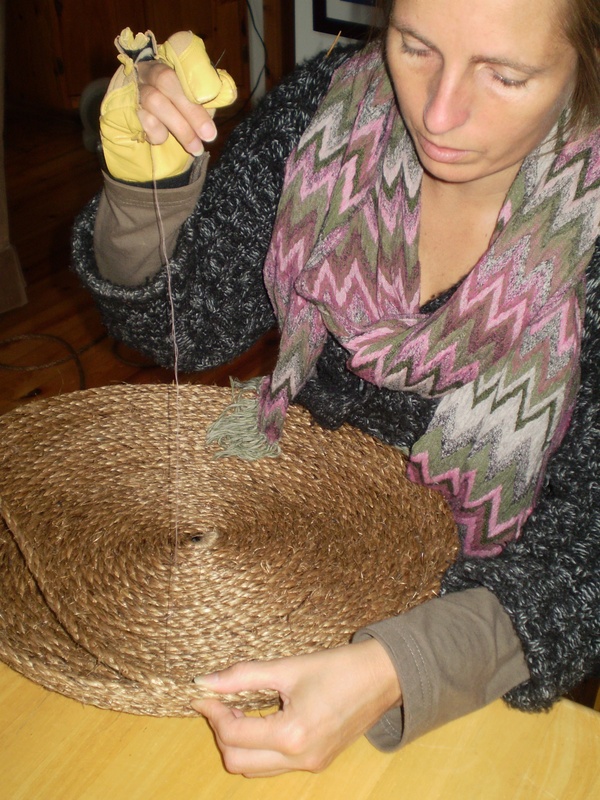 The rope dictates my work, each piece taking on its own shape. It has such a wonderful smell of docks, harbours and sailing. I am always looking for new rope designs. Each day is different. The only constant is my cup of tea in the mornings (I’m English). It is then that I start up the computer, check convos, facebook, my blog, make any changes and hope for sales. I always get excited at sales. I package them up and then work on replacing the item. I am constantly working on new stuff, I enjoy taking photographs and listing. I try to fit in housework (not my favourite and sometimes it gets missed) and make sure that I get a walk in the woods each day. I walk with my partner, Mark and my cat, Lucy. I also help Mark promote his boats at local craft shows, I design websites on the side and can’t forget to try and fit in sailing during our short summer. My day is never typical and always changing, but fun! I think my favourite will always be the manila doormats, this is where it all started and is my most popular listing. They are hardwearing and last years. I am always pleased with the new items I list. Just last week I received a custom order for a huge bowl, it took ages as each round is sewn individually, but was well worth it! It was beautiful and I didn’t want to part with it. I am always excited about everything I do, all new avenues and contacts. I think this is a great team and I am proud to be a part of it. Please come by and say hi! I have plenty of ways to meet you. I’ve always had beach sand in my pockets and a passion for the sea! A few years ago I had the incredible experience of sailing the East Coast from Maine to Key West in a 38′ sailboat and from there on to many Bahamas islands and much of the Caribbean, almost to S. America. This was over several years’ time, so I had a chance to spend time at the places I visited, absorbing sights, sounds and the islands’ memorable colors and the warmth of people everywhere. Now I’m a landlubber again and create pillows in a tropical and nautical style, my way of connecting with the colors and patterns from islands and seas loved and remembered. Once searching for a silk scarf, I googled and up came an etsy shop, my first awareness of etsy. I forgot about it until I began creating my pillows and happened to talk with a craft store owner who mentioned etsy again as a place to look into to sell my pillows. When I went back to etsy this time, I knew it was perfect for me. 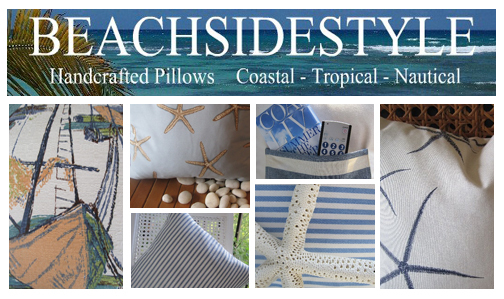 That was just over a year ago, and I’m having fun learning how to market and advertise my BEACHSIDESTYLE pillows, grateful for the overwelming amount of information, guidance and direction available from etsy and the wonderful people I’ve met along the way. I am a caregiver for 3 marvelous and wonderful boys aged 2, 6 and 11-1/2. My typical day begins with getting up 5AM and a 40 mile roundtrip drive done by 7:30 AM, and same again in the afternoon, driving every other week. Every week I care for my 2 & 6 year old friends, more fun than work! 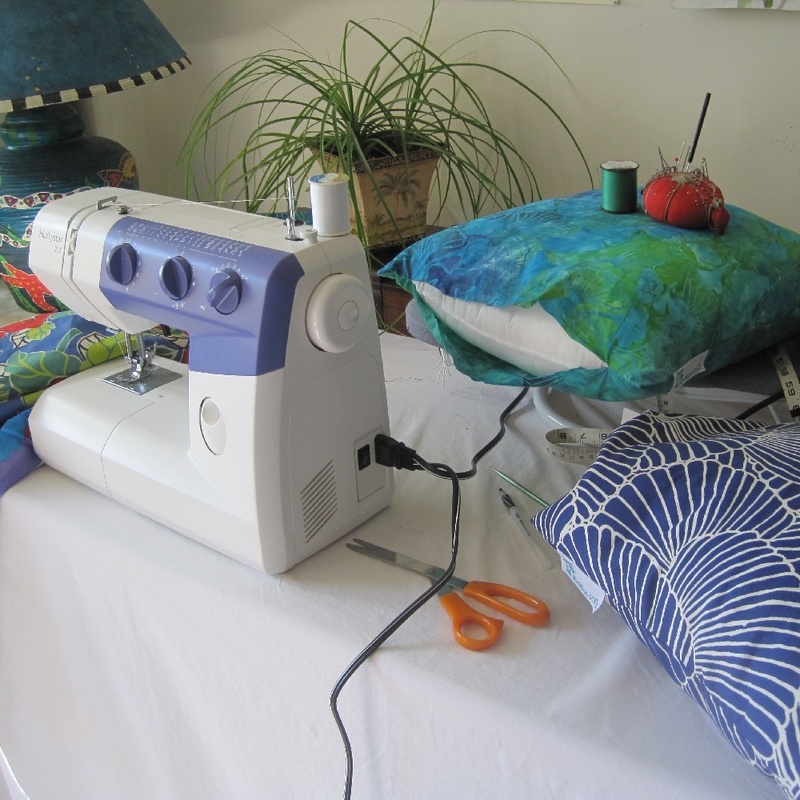 On the days I have to myself I measure, cut and sew, with a goal of getting at least one pillow a day into my Shop listing, but so far I’m not there yet, still working on it. At least once or twice a week I walk at the beach, a 5 minute drive, to soak in the peace and beauty, to renew my spirit….my favorite place in the world! My favorite item right now is my pillow with giant navy starfish, but hard to say, really, because my red hibiscus with blue has a place in my heart, too; reminds me of something from my childhood, maybe vintage fabrics and flower patterns. I am in awe of every one of them, their insight and talent! So many times I have come close to closing BEACHSIDESTYLE, as sales are just getting started and it seems like forever sometimes, but now I’m motivated to keep on, seeing their wonderful creations and successes. Also, I welcome all comments and suggestions, always, and am ready to help anyone in any way I can. I’m proud and delighted to be a member of etsy Team All Things Coastal! The Ocean Rocks!!! 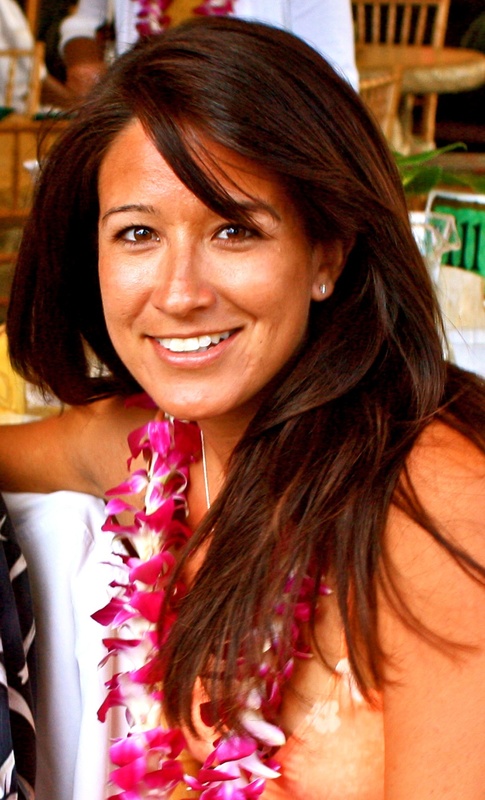 I am the mother to three handsome boys, the wife to my college sweetheart, jewelry designer and a true beach girl. I live in the beach side community of San Clemente CA with my family. My coastal surroundings are the inspiration to my unique and special jewelry designs. If I am not at my jewelry bench you will most likely find me down by the beach collecting sea glass or enjoying the coastal scenery. Searching for beach glass is not only my passion, but a family affair. We all enjoy the process of searching our beaches for amazing sea jewels. Aside from being a beach girl, I have always been passionate about fashion and jewelry trends. I possess a Bachelor of Arts degree in Fashion Merchandising from SDSU. Pre-children, I thought I would become a clothing buyer or an interior decorator. It wasn’t until I became a stay-at-home-mom, I developed the enthusiasm for jewelry design. I started my sea inspired jewelry line in 2008. A friend told me about Etsy and I signed up to be a member immediately. 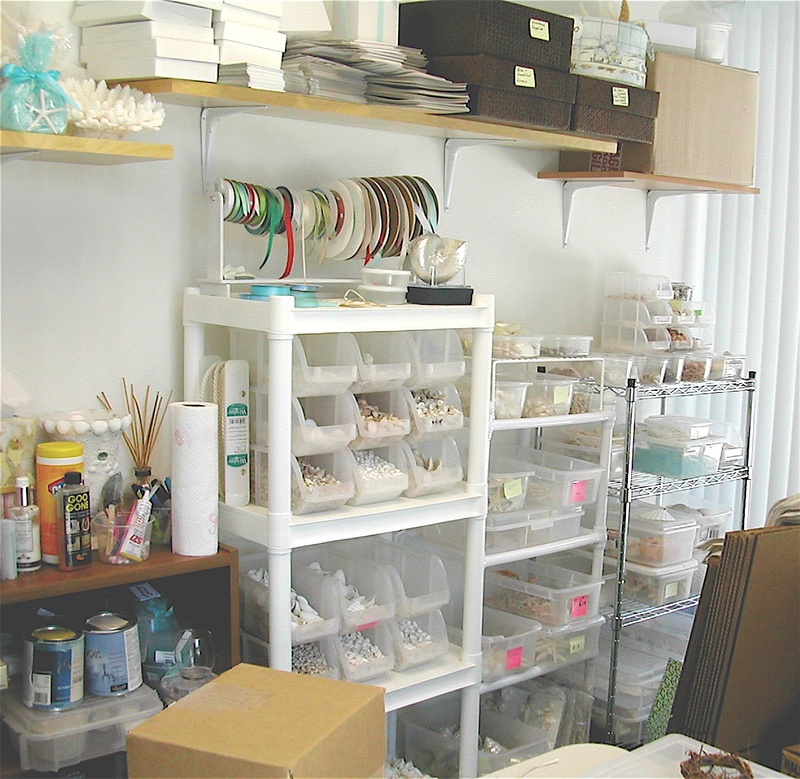 In January 2009, Mermaid Charms officially opened for business with the first jewelry listing. Etsy is the perfect venue to showcase my jewels at relatively low costs. I also appreciate all the tips and suggestions the community provides to sellers on building your business. My typical day is probably like any other mother out there. The mornings are dedicated to getting the boys ready for school and out the door on time…not an easy task I might add. After dropping the kids off, I will hit the beach trail for a 5 mile run. My runs allow me to clear my head and check out the beach for sea glass. By 10:00, I’m on the computer, checking emails or convos. I update my Facebook fan page and twitter account at least once in the morning. I have made some great connections through these social networks and its a great marketing tool. Finally, I will list one or two new items in my Etsy shop before heading to my jewelry bench. My current goal for Mermaid Charms etsy shop is to be filled with 100 pieces by the beginning of December. I am half-way there! 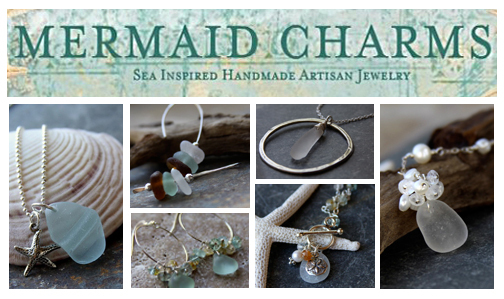 I have two jewelry lines, Mermaid Charms and Kim Voigt Jewelry. I make it a priority to keep my pieces fresh and current and because of this mindset, the design process is the most important part of my day. I try to dedicate at least 2 hours a day to creativity. The last free hour of my afternoon is spent photographing jewelry pieces or more Etsy listings. By 3 o’clock, my kids are home and all jewelry activities are put on hold until the evening when I will do some computer work or social networking. I typically set aside Friday to touch base with my retail accounts to fill orders, pull merchandise, and get employee feedback. Juggling family life and a small business has its challenges but that’s what makes life interesting. I wouldn’t have it any other way! I can’t say that I have a favorite item in my shop because every piece has a story. I’m always wondering ,where did this piece of sea glass come from or how old could it be? I do have a favorite color- aqua! I am really excited to be part of a team so inspired by the beauty of our beaches. I am happy to help, promote, encourage, and cheer on other members. See ya at the Beach! If you would like to see more of Mermaid Charms, please visit her etsy shop, facebook page, and twitter page. Look, it's a Starfish!… and a Seahorse!